So here’s the first of the MoviePush movie marketing reviews that I detailed in a post a week ago. Not quite a traditional review of a film, this is an opinion of whether the marketing successfully (and honestly) conveyed what audiences could expect from the film. In other word, did the film deliver on its “marketing promise”. Firstly, let’s get the generic review bit out of the way. 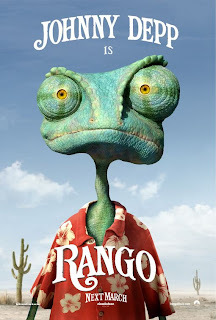 I really enjoyed Rango, I thought it was smart and quirky and therefore would be suitable for adults and children alike. It had some very clever ideas throughout the whole film, and although the overall basic story isn’t the most original the uniqueness and creativity applied to the characters and the situation make it all seem very fresh. The CGI in the film is incredible, I seriously think this is the best CG I have ever seen in a fully animated film, even better than Pixar. Disregarding the fact that these are talking animals, the texture of them and everything else looks as good as real. Very impressive. So onto the marketing, personally I didn’t see any innovative or unique advertising for Rango, but I do feel all the standard marketing used (posters, teasers, trailers, etc) did a very good job of conveying the tone and sensibility of the movie. I was expecting a somewhat quirky comedy, set in the Wild West paying homage to old spaghetti westerns with some great action and that’s essentially what I got. This is the best type of marketing really, successfully setting the tone of the film without giving away any of the surprises. High marks for both the film and the marketing.